In our previous post, we reviewed the causes of elevator and escalator accidents and the common injuries that victims suffer. In this post, we’ll be discussing the long-term consequences of these accidents and some of the legal issues you may encounter. 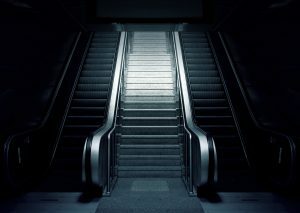 Escalator accidents can be traumatic events with consequences that go beyond the medical bills. What may seem like a relatively minor injury could negatively change your life for months and years to come. Who Is Responsible for Your Injuries and Other Losses? If you’ve been injured, you’re probably worried about getting treatment for your injuries and how you’re going to pay your bills. Unfortunately, sorting out who is at fault for your accident can be quite difficult. Escalators and elevators are typically found in buildings owned by corporate entities. These corporations may not be willing to admit fault and are likely to claim that some other corporation should be held responsible. You should also bear in mind that they will be represented by lawyers who will use their knowledge of the law and the legal system to the corporation’s advantage. The property owner. Property owners have a duty to ensure that their property is safe for their guests and anyone else who is allowed to be on the property. When a guest is injured as a result of the property owner’s negligence, the property owner may be held liable. A property owner is negligent when they fail to correct an unsafe condition they knew or should have known about. If the property owner knew or should have known that the elevator was dangerous, they should have prevented guests from using it until it could be repaired. The elevator servicing company. Property owners typically hire another company to regularly inspect and maintain their elevators. If the serving company did not conduct regular inspections or fail to make necessary repairs, they may be held liable. The elevator manufacturer. If your injury was due to the design of the elevator or escalator, you may have to sue the designer or manufacturer. The construction company who installed the elevator or escalator. If your injury was due to poor construction, you may have to sue the company who constructed and installed the elevator or escalator. It’s important to keep in mind that each of those parties is likely to blame the other for causing your accident. As a result, there may be multiple parties that need to be held responsible. Since 1992, the attorneys at Slappey & Sadd have been helping injured Georgians get the compensation they need to move on with their lives. We offer our clients responsive and effective legal representation. If you’ve been injured in an elevator or escalator accident, schedule a free consultation with one of our lawyers by calling 888-474-9616 or contacting us online.